Huston Vineyards brings you Chicken Dinner Wines, named for the road that Huston Vineyards calls home. Chicken Dinner Road is where you’ll find our farmhouse, farm, estate vineyards, and winery, which is actually a Winery barn. But our barn is only for wine, and the aroma is of premium wine, uncorked for your tasting enjoyment. Our passion is to create exceptional wine in the classic tradition, from the best fruit to be found. The naming of our Chicken Dinner wines celebrates and plays off a classic Southern Idaho tale—the story behind one of the most curious road names around. Although not the least bit pretentious, these wines have annually achieved notable recognition from distinguished wine judges, including Sunset Magazine’s International Competition. A blind taste test hides the label’s humble rooster, but the delicious wine in the bottle has proven to be, well, something to crow about. Cross the road, get to the other side—this wine is worth the trip! “Table wine” sounds oh, so humble, but both our Chicken Dinner Red and White have garnished accolades from notable sources, including Wine Enthusiast and multiple competition judges. What we set out to achieve was a premium wine for a modest outlay. 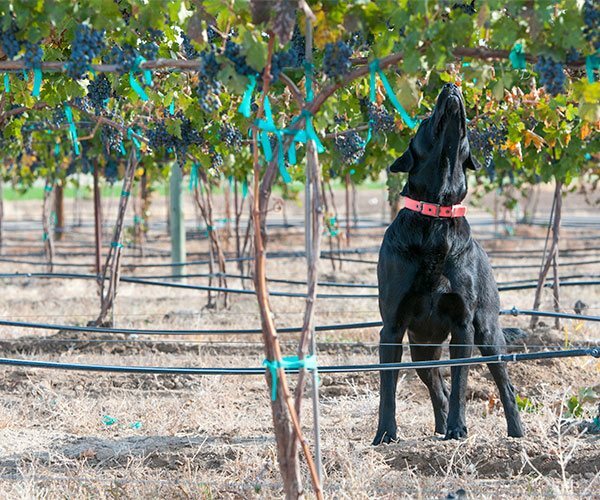 Sourcing fruit from reliable vineyard sites, the blends have proven to be wildly popular. Our widely-available series is found in the wine departments of grocery stores throughout Southern Idaho, as well as grocer’s wine departments, and many fine restaurants. Look for the rooster, pointing you in the direction of an award-winning wine concept that was initially cooked up in our farmhouse along Chicken Dinner Road. Our back label shares the historic tale of how the road got its curious and infamous name. This special wine extends the fame! Our Rose has joined the Chicken lineup, and this third time looks to be a charm. 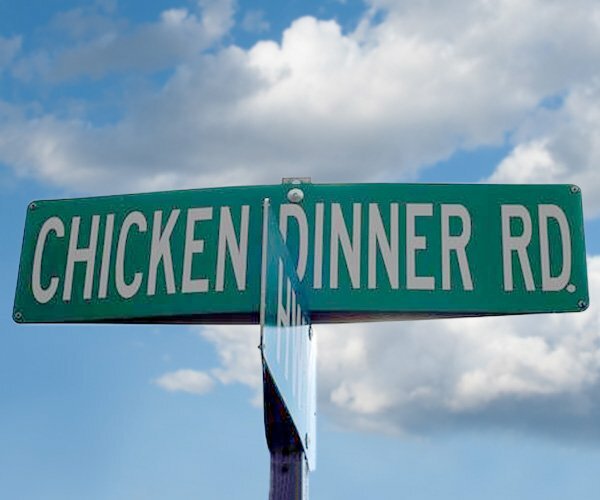 How did Chicken Dinner Road get its name? Years back, well before pavement, it seems a legendary cook invited an unsuspecting Idaho governor to dinner. Following the sign pointing to the chicken dinner, the governor arrived and soon realized that more than chicken was on the table. Accompanied with mashed potatoes was a proposal: in exchange for a great dinner, see to it that the cook’s rutted old farm road was properly oiled. The governor’s options seemed a bit hard to swallow—leave before the apple pie was served, or find a way to help the cook. The evening ended, resulting in a full governor, a happy cook and a legendary road name. The Chicken Dinner Wine series are made from our vineyards in conjunction with premier vineyards in the Northwest. Our brand promise with Chicken Dinner is to provide a premium Idaho wine that is crafted from fruit from the Northwest and undergoes the same level of quality that we create with our Huston wines. Our whimsical, country label adorns a seriously outstanding wine that has become a real favorite in the Northwest. 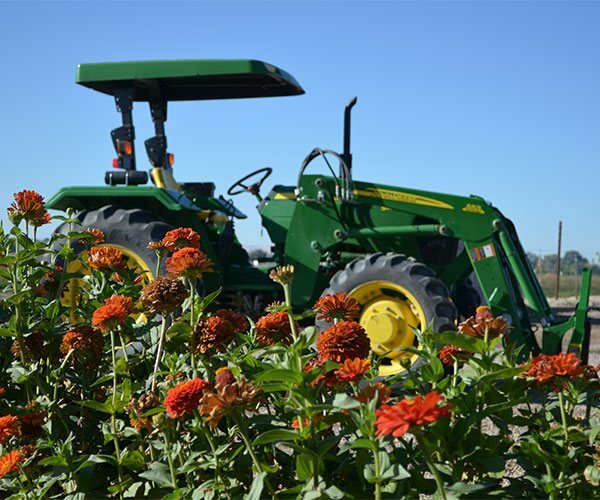 Check out our Huston Vineyards and Chicken Dinner Wines clothing and hardware merchandise.